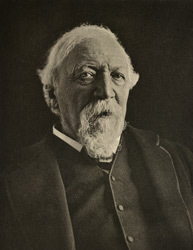 "The photograph of Robert Browning, reproduced in this number, will be for ever precious to those who knew the poet in his vigorous old age. The rugged force of that massive head combining the majesty of Buonarroti's Moses with a delicacy of curve in the forehead and a watchful intensity in the keen clear eyes, remains stereotyped in her plate. Set it beside Watts' picture; and the comparison of these two interpretations, the painter's and the photographer's, will enable those who come after us to form an accurate conception of Browning as he really was."